It offers many of the features you would expect from church management software, such as tracking membership, visitors, activities, equipping, pastoral care, meetings, library items, and contributions. In addition, the program also helps you keep track of all that is happening in your small group structure. Ministry Assistant features flexible reporting with the option of saving to several popular file formats. 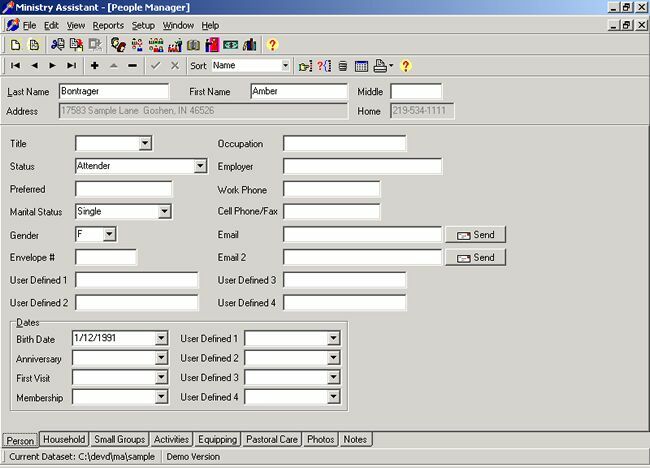 It also features mail merge, built-in e-mail to both individuals and groups, and can easily be used in a multi-user environment. The powerful Meeting Manager allows you to keep track of attendance and visitors at your worship services and other church events. Here is some of what the program can help you do: Maintain information about each person and household in your church (including their picture), maintain information about each small group in your church, track small group meetings and attendance, maintain information about the activities and ministries in your church, track attendance at meetings, track visitors to your church, track classes and seminars offered by your church and who attended, track the pastoral care given to persons in your church, track contributions made by the people in your church, keep track of items in your church library. Other features include integration with Microsoft Office products, built-in e-mail support, and full network support.